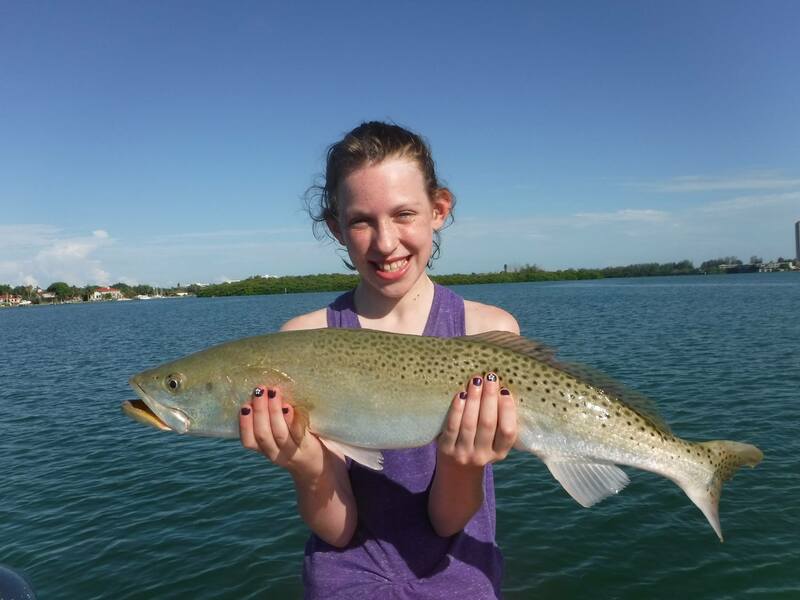 There is a relatively untapped fishery in Sarasota in the late summer and early fall. Each year at that time of year schools of mangrove snapper migrate out of the creeks, canals, and backwaters and towards the Gulf of Mexico. Fish will move out into the channels and then the passes. Any structure such as docks, bridges, rip-rap, and oyster bars may hold a bunch of snappers. The abundant structure and deep water make the north end of Siesta Key a great spot for snapper and other gamefish as well. Late in the run (mid-September) ledges and reefs close to shore will hold large numbers of these tasty saltwater panfish. I run a lot of Siesta Key snapper fishing charters in the fall. 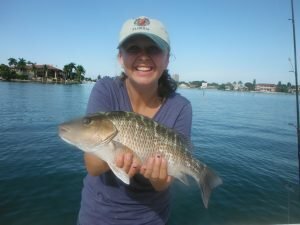 The key to successful Siesta Key snapper fishing charters is staying on top of the local migrations. These guys are hungry and will eat, the key is finding them. As a full time guide I have the advantage in that I am out there almost every day and can stay current with prevailing conditions. Generally, I start targeting them in late July. The channel edges of the Intracoastal Waterway from Stickney Pt. Bridge north to Siesta Drive Bridge hold schools of snapper in the late summer. Once the fish are located it is just a matter of staying on them as they migrate out to the Gulf of Mexico. Outgoing tides are best, but not necessary. 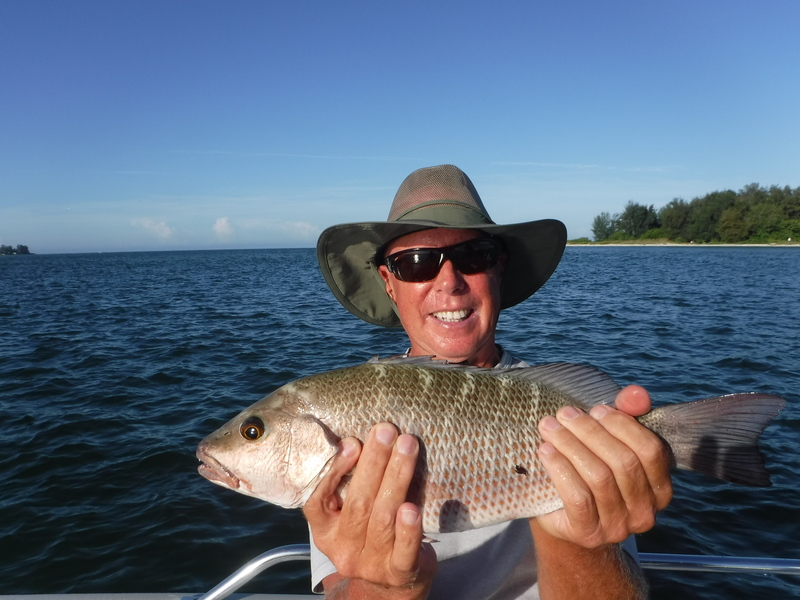 Another advantage to targeting mangrove snapper is that they will bite later in the morning when the shallow water fishing slows down. Often times, I will hit the grass flats at first light then finish up the morning fishing deeper for the snapper. One enjoyable aspect of Siesta Key snapper fishing charters in Sarasota is the simplicity. Basically, I tie on a piece of 20 pound leader and a #1 hook and add a bit of weight, if needed. I prefer a sturdy short shank bait hook. In water ten feet or less a split shot a foot or so from the hook will be all the weight that is needed. This also allows the bait to sink slowly and naturally. When fishing deeper water or in a strong current, more weight will be required. I use a “Knocker rig” in this application. This is simply a sliding egg sinker, usually a quarter or half ounce, threaded on to the leader in front of the hook. The weight actually sits right on top of the eye of the hook. The sliding weight allows a fish to pick up the bait without feeling any resistance. The most technical aspect of Siesta Key snapper fishing charters is boat positioning. The best approach is to anchor a cast away up-current of the structure or ledge. The bait can then be presented in a natural manner as it drifts back to the fish. The same theory applies to anglers fishing from docks or the shoreline. Cast structure that is down-current from your position and allow the bait to fall back towards the pilings or rocks. In deep water, such as ledges in the inshore Gulf or the rocks at the mouth of Big Pass, a vertical presentation is best. While I have fooled plenty of snapper using plugs and jigs, this is primarily a natural bait situation. My personal favorite is a live 2”-3” pilchard. These are not available at bait shops and must be caught with a cast net. While live shrimp work great and are easily obtained, pilchards and small pinfish will catch larger snapper than live shrimp. When using shrimp, anglers will have to sort through smaller fish, but plenty of decent sized fish will also be taken. Baitfish can be hooked through the mouth, nose, throat, or back and shrimp are usually hooked under the horn, right behind the eyes. Cut fresh and frozen bait can also be used successfully. Frozen squid can be cut into strips while chunks of baitfish work well. If available, fresh cut bait will usually be more productive than frozen bait. Snapper can be delicate in their take and hooking them requires a slightly different technique. I have found the best method has been to cast out the bait and allow it to settle. Sometimes the fish will just take it and run, and if this happens just reel fast and raise the rod tip. But most of the time it begins with a light “tap”. There may be several more “taps” before the fish takes the bait. It is crucial to not move the bait at all during this time. Instead, wait patiently for that steady pull and just reel while raising the tip. Don’t jerk or set the hook! One final bonus to this technique is that it will not only produce a tasty snapper dinner, other fish will invariably be caught. Snook, redfish, trout, flounder, sheepshead, drum, pompano, and more with hit a well presented live bait near structure. One particular trip comes to mind. I was catching the last few minutes of the outgoing tide and free lining live shrimp along a drop-off near the Siesta Drive Bridge. The drag and my anglers reel started to scream and when it was over an eight pound permit was resting in the net!